Magpie Murders by Anthony Horowitz – a really satisfying read, with believable characters, set in beautifully described locations, tantalisingly mysterious and so, so readable. I loved it. Joyland by Stephen King – a ghost story, a love story, a story of loss and heartbreak. It’s also a murder mystery and utterly compelling to read. Accidents Happen by Louise Millar – At first I was enjoying this book ‘“ it’s very readable, but I didn’t think it was plausible and I couldn’t suspend my disbelief. The Black Caravel by Harry Nicholson set in 1536 this is a fascinating story about ordinary people set against the background of national affairs and how it affects their lives. I really enjoyed it. The Blood Card by Elly Griffiths – a most entertaining book, with a convincing cast of characters. The mystery is expertly handled, with plenty of suspense and lots of twists and turns as the separate plot strands are intricately woven together. I loved it. The Songlines by Bruce Chatwin – a fascinating account of Chatwin’s visit to Australia to find out about the Songlines and the myths of the legendary totemic beings who sang the world into existence as they wandered over the continent in the Dreamtime. Autumn by Ali Smith – a poignant and cutting novel about modern life, how we got to where we are, and the mood of the country post-Brexit. It’s a remarkable book. The Dark Flood Rises by Margaret Drabble – this novel explores the ending of life, the nature of ageing, and life and death. But it is by no means depressing or morbid. I liked it very much. It’s densely layered, thought provoking and moving. Another Day Gone by Eliza Graham – another excellent book – review to follow. For most of the month I was also reading The Fishing Fleet: Husband Hunting in the Raj by Anne de Courcy. I had hoped to have finished it before the end of October but I’m reading it very slowly. I’ve read 44% and have decided to put it on hold for a while. It’s non-fiction and I shall be able to pick it up where I left off without having to go back to the beginning! My book of the month. 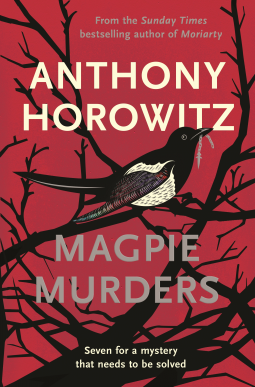 and also my Crime Fiction Pick of the Month, is the brilliant Magpie Murders by Anthony Horowitz. 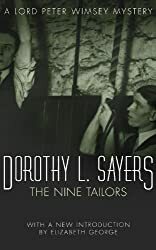 It’s a a puzzle-type of crime fiction combining elements of the vintage-style golden age crime novel with word-play and cryptic clues and allusions to Agatha Christie and Arthur Conan Doyle. It’s also a novel within a novel, with mystery piled upon mystery. I loved it. September was a good month – we had a holiday in the Lake District, the sun shone and it’s been a dry September, according to the Met Office it was the driest September since records began in 1911! The Sunrise by Victoria Hislop – my review will be on the next issue of Shiny New Books (I think!) Set 40+ years ago in Cyprus, I liked this very much – a story of human tragedy in the face of war. The Goldfinch by Donna Tartt – review to follow. Wycliffe and the House of Fear* by W J Burley – Wycliffe investigates the disappearance of Roger Kemp’s second wife. A complex story with sinister undercurrents. Testament of a Witch* by Douglas Watt –MacKenzie investigates the death of Grissell Hay, Lady Lammersheugh accused of witchcraft in a village overwhelmed by superstition, resentment and puritanical religion. The Moving Finger* by Agatha Christie – anonymous poison-pen letters, an apparent suicide and a murder in a peaceful country backwater in this Miss Marple mystery. The Yellow Wallpaper by Charlotte Perkins Gilmore – a suspense story of a young woman slowly but surely losing her mind – or is it a case of a woman suffering from post-natal depression. Entry Island* by Peter May- set in present day Magdalen Islands, part of the province of Quebec, in the Gulf of St Lawrence, and in the nineteenth century on the Isle of Lewis at the time of the Highland Clearances. It mixes together two stories and two genres, crime fiction and historical fiction. The Brimstone Wedding* by Barbara Vine €“ one of the best of Barbara Vine’s books that I’ve read. Stella gradually confides in Jenny, telling her things she has never said to her son and daughter €“ things about her life she doesn’t want them to know. Barbara Vine, writes beautifully and powerfully yet in a controlled manner, and the subtle horror of what I was reading gripped me. The Shroud Maker* by Kate Ellis €“ a complex, historical mystery intertwined with a modern day murder mystery for D I Wesley Peterson to solve with plenty of characters, red-herrings, twists and turns, and sub-plots. The Brimstone Wedding by Barbara Vine. For more Crime Fiction Pick of the Month books see Kerrie’s Crime Fiction Pick of the Month over at Mysteries in Paradise. I enjoyed every one of them, but there are a couple of outstanding books, one of which is Crucible by S G MacLean and that is my Crime Fiction Pick of the Month. 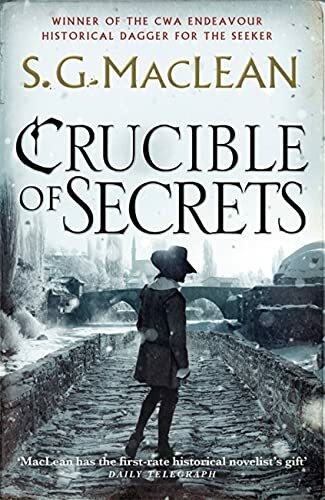 I was transported back to 17th century Scotland where Alexander Seaton investigates the murder of his friend, Robert Sim, the College librarian at the Marischal College in Aberdeen. It’s absolutely compelling reading, including a quest for €˜a secret, unifying knowledge, known to the ancients‘ since lost to us. There are many twists and turns and another man is killed before he finally arrives at the truth. For more Crime Fiction Picks of the Month see Kerrie’s blog, Mysteries in Paradise. 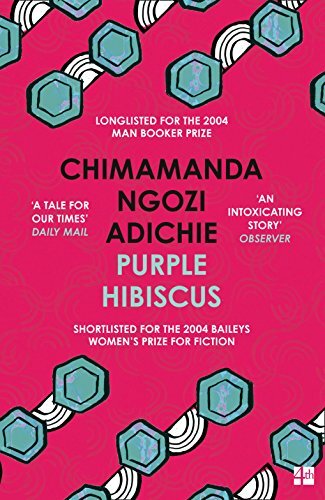 The other outstanding book is Purple Hibiscus by Chimamanda Ngozi Adichie, which I have yet to write about. I found this book quite hard to read when it was about the abuse happening to some of characters. In some ways it is a dark book and yet in other ways it is uplifting. Another book that I didn’t want to end and at the same time I wanted to rush through it to see how it would end. I’ve had this book for nearly six years and am so glad I eventually got round to reading it. Also worth a mention are The Thirty-Nine Steps by John Buchan and Ethan Frome by Edith Wharton (no review post as yet). I read both on my Kindle, both are short books, but beautifully composed, taut and precise. Of the two I think Ethan Frome has the edge, mainly because of Wharton’s descriptive writing evoking such an intense atmosphere. I’m doing well at the moment sticking to reading my TBRs (books I’ve had since before 1 January 2014) – I’ve plenty to choose from – although I am wavering and have started to read a library book. I keep finding books I haven’t included in my LibraryThing and Goodreads catalogues, so although the numbers of unread books on the shelves are going down, the numbers on LT and GR aren’t. And I have bought a few books this year to add to the unread totals! Instructions for a Heatwave is a book I bought this year; it’s shortlisted for the 2013 Costa Novel Award. The Midwich Cuckoos is an e-book I borrowed from the Kindle Users Lending Library. Three of the books are books I’ve owned for several years (the To-Be-Read books). It was a good month for reading. Just two of the books are crime fiction – Saints of the Shadow Bible and N or M? 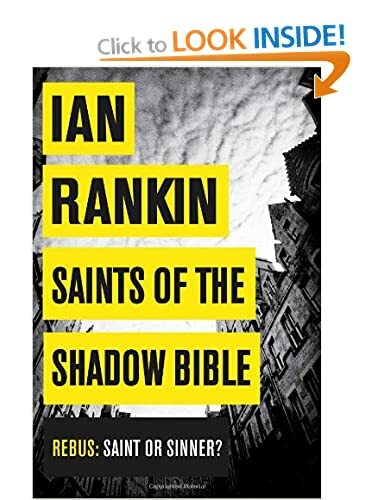 Both books are by writers at the top of their form, but Ian Rankin’s Saints of the Shadow Bible is my Crime Fiction Pick of the Month. See Kerrie’s blog for more Crime Fiction Picks of the Month. It’s been a good month as I’ve read 6 books from my huge pile of unread books, bringing my total of TBRs up to 20 for the year so far. I’m aiming to read as many of my own unread books as I can this year. There are also 2 non fiction books – shown underlined – a total of 8 for the year so far. I always intend reading more non fiction but usually get sidetracked by the fiction. It generally takes me longer to read non fiction than fiction, so to read 2 in one month is good for me. Four of the books I read are historical fiction and this means I’ve nearly reached my target of 15 books for the year. I think the best book I’ve read this month has to be To Kill a Mockingbird by Harper Lee. I loved it and hope to write more about it soon. Crime fiction is currently making up about half of my reading and this month I’ve read 5. Each month Kerrie at Mysteries in Paradise hosts a post linking to bloggers’ Crime Fiction Picks of the Month. My Pick this month is The Red Coffin by Sam Eastland. It is 1939. The world stands on the brink of Armageddon. In the Soviet Union, years of revolution, fear and persecution have left the country unprepared to face the onslaught of Nazi Germany. For the coming battles, Stalin has placed his hopes on a 30-ton steel monster, known to its inventors as the T-34 tank, and, the ‘Red Coffin’ to those men who will soon be using it. But the design is not yet complete. And when Colonel Nagorski, the weapon’s secretive and eccentric architect, is found murdered, Stalin sends for Pekkala, his most trusted investigator. Stalin is convinced that a sinister group calling itself the White Guild, made up of former soldiers of the Tsar, intend to bring about a German invasion before the Red Coffin is ready. While Soviet engineers struggle to complete the design of the tank, Pekkala must track down the White Guild and expose their plans to propel Germany and Russia into conflict. I haven’t read Sam Eastland’s first book, Eye of the Red Tsar, about Inspector Pekkala but I had no difficulty in understanding the background to the novel – it works well as a stand-alone. It’s a fast paced plot with flashbacks to Pekkala’s earlier life as an investigator for the Tsar. He is now an investigator for Stalin, charged with discovering the murderer of Colonel Nagorski. A nicely complicated plot, mixed in with historical facts, but as I know very little Russian history I can’t comment on its accuracy – some interesting information about the Tsarina and Rasputin, and Stalin doesn’t come across as the character I thought he was though. I enjoyed it and it kept me guessing until the end.